"A delicious holiday turkey glaze." 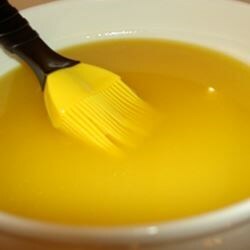 In a small bowl, whisk together the apple cider, butter and honey. Brush over entire bird 45 minutes before it completes cooking. Repeat several times before removing turkey from oven. These turkey burgers are so tasty, you may just give up beef for good. I made this glaze last year for Thanksgiving. It made my turkey soooooo yummy. My entire family really loved it. This was an easy recipe for honey glaze ,I will be trying this glaze again . I have used this reciepe for years and ( just no getting around to doing a review) i love it It does not add flavor but beautiful color that is why you do it at the end. Used apple cider, instead of juice. Also helps to let the butter cool down a bit before basting the turkey. This gave a good, slightly sweet flavor to the skin. I used apple cider and the galze did give the turkey a beautiful color but u couldn't taste a differance though.